Russian Retail Lending: Hitting A Growth Ceiling? There is still strong upside potential for retail lending, thanks to the mortgage segment, but this potential is unlikely to be realized in the near term. While developed economies face the need to deleverage, emerging markets still have the opportunity to grow by taking on more debt. Russia is no exception: government debt is only 10% of GDP, and corporate debt 57% of GDP. Households’ exposure to bank loans is 13% of GDP. That last area would appear, at first glance, to offer huge upside potential, given that retail loan penetration in developed countries is 80% of GDP. It suggests that the Russian population can continue to take on debt in order to finance consumption. However, the reality is not that rosy. Of the 13% of GDP overall retail lending penetration in Russia, 10 of those percentage points come from consumer loans. In 2003, the figure was a mere 1% of GDP, but thanks to 50% average annual growth over the past decade, the level in Russia is now comparable with that in developed countries. 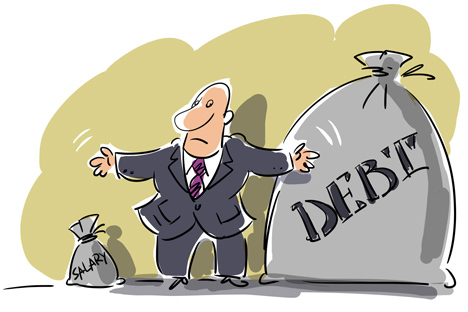 Russia’s non-mortgage debt is around 160% of the average monthly salary, in line with the level in developed European countries. To put these figures into plain speech, the Russian consumer-lending market appears to have reached its ceiling. Indeed, concern for potential overheating on the retail lending market was probably the basis of the Russian Central Bank’s introduction of tighter provisioning requirements for unsecured loans last year. Decelerating growth has caused a deterioration in loan quality. Slower growth hit borrowers that managed their debt positions poorly. A widely cited report from Svyaznoi Bank suggests that 19% of Russian borrowers are servicing at least five loans. Given continuing income growth in Russia, we at Alfa Bank expect growth in the non-mortgage lending market to stabilize around 25%-30% this year. It is unlikely to accelerate going forward. The main cause for hope is the mortgage market, which equals only 3% of GDP, making it virtually non-existent compared with other countries. Only a little over a million Russians, or a mere 1% of the population, have mortgages, suggesting tremendous growth potential given the 40% penetration in the EU. However, there are constraints on both the supply and demand sides. Russian banks lack long-term funding, and the complex regulation of the mortgage-lending segment is also an issue. The conclusion to be drawn from all this is that there is still strong upside potential for retail lending, thanks to the mortgage segment, but this potential is unlikely to be realized in the near term. Natalia Orlova is the Chief Economist at Alfa Bank in Moscow.